Le groupe UKF a en stock la plus grande gamme de tubes d'échappement perforés d'Europe. Nos tubes sont utilisés dans l’automobile, dans les systèmes d'échappement et de filtration. Nous avons en stock le motif standard 6011 en acier inoxydable Grade 304 (1.4301) et Grade 409 (1.4512) en longueurs allant jusqu'à 6 mètres. Des longueurs sur mesure et des motifs alternatifs sont disponibles sur demande. 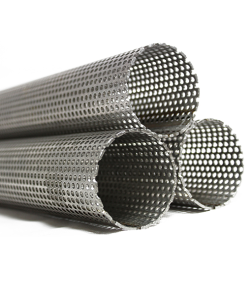 We have worked alongside UKF for 20+ years purchasing high quality 304 and 409 stainless steel tubing. We have developed high quality decorative trims for OEM using their materials which are polished to an extremely high Automotive standard. We look forward to continually working with UKF into the future and thank them for their continued support.